Spent too much money at Christmas time? As always we have our monthly specials at 10% off until Jan 31. At this price the cost per bottle works out to between $2.80 - $2.96 and the white, $2.60 - 2.80. World Vineyard Spanish Tempranillo - Gorgeous ruby red in colour, this medium-bodied wine is Spain's answer to Cabernet Sauvignon, with berry, plum and herbal notes running to a lush finish of tobacco, leather and vanilla. Serve with roast pork, sheep's milk cheeses, roasted vegetables or lamb. World Vineyard French Sauvignon Blanc - Steely, grassy, herbaceous the classic traits of palate-cleansing Sauvignon Blanc are here in this version sourced directly from the French countryside. Crisp and dry, this refreshing wine is a fabulous match with food, as its full, fresh flavours and wonderfully balanced acidity make it essential with chicken, fish and grilled vegetables. Vintners Reserve Vieux Chateau du Roi - Robust, rounded and smooth, the bouquet of berries and flavours of ripe plum are beautifully integrated into an elegantly structured finish with hints of oak that will reward ageing. Vintners Reserve Piesporter - Transported from Germany's Mosel wine region, this wine is characterized by vivid fruitiness and lively acidity balanced perfectly by floral aromas and a perfect amount of residual sweetness on the finish. If you have read this far I suspect you are really looking to save some money so I will not disappoint. 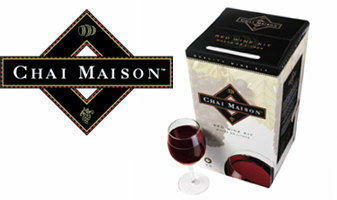 In the wine department we have put the entire Chai Maison line on sale for 25% off the regular price. You cant even get a bottle of Two Buck Chuck for this price. The Whites work out to $1.86 per bottle and the reds at $2.00. Chardonnay - Bursting with fruit flavour within a distinct oak character. Exceptionally smooth and pleasing on the palate. A popular favourite. Liebfraumilch Style - Delightfully fruity, thirst quenching German style wine. Perfect with spicy foods. Pinot Blanc - Dry and crisp, with a delicate fruity finish thatï¿½s perfect with light cheeses, seafood and delicate meats. Sauvignon Blanc - Clean, fruity aroma; distinctive grassy bouquet. A crisp, fresh wine with wonderful fruit character. Cabernet Sauvignon - Deep dark colours and a richness of flavour combining firm tannins with ripe red fruits enhanced by oak. Merlot - Rich red in colour, this variety is soft, smooth and full of the berry fruit flavours that make it so popular. Pinot Noir - The grape that made Burgundy famous. Vibrant blackberry and cherry fruits dominate within a silky smooth texture. Vieux Chateau du Roi - An incredibly popular blend that offers up layers of intense flavours and aromas, with oak weaving its way in. Now if your a beer guy we have the ultimate deal. 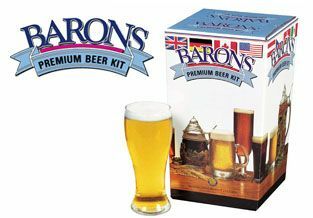 The entire line of Barrons Kits are 25% of the regular price.That works out to 46 cents per bottle which is about as good as you can get anywhere! Canadian Draught - Creamy beer with a sparkling golden colour. Lightly hopped to bring out the true, just-tapped flavour of pub-style draughts. Canadian Golden Ale - Beautiful pale coloured beer with slightly more hop flavour than typical Canadian beers. True to its style, C.G.A. is malty but well-balanced. An exceptional beer for the North American ale enthusiast. Canadian High Test - Higher alcohol content of a strong beer with a decidedly Canadian twist. Smooth and flavourful, robust and bold. For the brave at heart, not the weak-kneed. Canadian Lager - Similar colour and flavour to commercial varieties without the additives. Clean, cool and effervescent - a true slice of Canadiana. Canadian Pilsner - Slightly more hop flavour than typical domestic lagers with a smooth finish. Light in colour, but full in flavour. For those who want a little more flavour in a Canadian style beer. Mexican Cerveza - Nothing quenches better than this – the quintessential summertime beer. Light and easygoing, with that special hint of flavour. All you need is this on ice with a plate of limes and you're home free. Amber Ale - Malty rich flavour and body. This reddish ale has slightly more bitterness than typical ales but its maltiness gives a nice balance between sweet and bitter. Our unique blend of 2-row pilsen, crystal and chocolate malts gives this ale its incredible character. Brown Ale - Deep, chestnut coloured ale with a full-bodied, roasted malt flavour. Precisely balanced with hop flavour, aroma, and maltiness to bring out this beer's true character. Dutch Lager - This globally popular beer reflects the styles of Grolsch and Heineken, with a crisp golden lager character and smooth spicy hoppiness, rounding out to a gentle, grassy finish. Crisp, distinct and delicious. Pale Ale - A superior rendition of this famous ale beer. It has a rich, chestnut colour with a slightly higher hop bitterness for a true English pale ale flavour. Redwood Ale - A copper colour cream ale with traditional Canadian hop flavour and aroma. The superior maltiness and body in this flavourable ale are derived from a special blend of 2-row pilsen malt and crystal malt. Full and refreshing.